If any of you are in or around London on Wednesday 25th August, I’ll be performing a live show based on this blog at the Homework literary cabaret night in Bethnal Green. 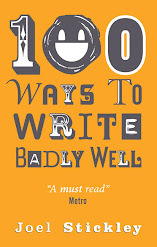 I’ll be reading a few blog posts, dispensing advice on becoming a better bad writer and generally lowering the tone. It’s at The Bethnal Green Working Men’s Club, 44-46 Pollard Row, London E2 6NB and it only costs £3 to get in. If you like the sound of that, please do come along. PS. I do not regard “living on a different continent” as a valid excuse. Dash Gallant stood over the cowering traitor, his dark eyes twinkling with disappointment. He ran a muscular hand through his thick, luscious hair. Sleezely wiped the sweat from his pimply brow and tugged at his lank moustache with one malformed hand. He was squirming with discomfort, his withered leg shaking uncontrollably beneath him. Dash shook his perfectly-proportioned head in pity. ‘I should have known never to trust someone so ugly,’ he said, placing one slender yet powerful finger on the airlock release switch. ‘No, pl– pl– please!’ stuttered the lopsided midget pathetically. ‘I’m sorry,’ said Dash, with a compassion that shone through in his rueful, heart-melting smile. As the hatch slammed shut and the airlock spat its physically repulsive contents into the emptiness of space, the moderately attractive engineers who had gathered to witness the confrontation breathed sighs of relief. The Doctor sat down and removed his glasses. ‘I’m afraid the situation is very serious,’ he said. I scanned his face for clues. ‘What does that mean?’ I asked, quietly. I blinked to hold back the tears. I knew what this meant. The lycra bodysuits, the pristine white snow, the lucrative promotional deal advertising Bran Flakes – all of it was gone. I could feel the bottom falling out of my world. ‘Oh, I... You’ll have to excuse me,’ I said. By the time the family had gathered their possessions, it was close to lunchtime. ‘Certainly not any time soon,’ joked her father, jerking his thumb at the soldiers. ‘Unless they want to share their rations with you!’ The family laughed. As I dangled from the precipice, I felt absolutely certain that I would die. My fingers were slipping slowly but inevitably from the ledge and with no one else for a hundred miles in every direction, I knew for a fact that there was no hope of rescue. In fact – and I don’t mind telling you this now, in the warmth and comfort of my own home – I had fully accepted the fact of my own death even before I lost my grip and went hurtling into the abyss below. As dictated by cliché, the entirety of my life unfolded in my mind’s eye, from birth through childhood to early adulthood and finally to this, my final, fatal misadventure. As I tumbled through the air towards absolutely certain death with no hope of a reprieve, I found a strange kind of peace. I knew beyond a shadow of a doubt that my days were at an end (to the extent that if by some highly unlikely miracle I was to survive, it would be so unfeasible as to to be virtually an insult to any hypothetical audience who might be observing me). I was a goner and I knew it. He lifted the object and examined it. It was the same as it had been that time before, just after the event which had changed his life. Just thinking about it sent a chill down his spine, for obvious reasons. ‘Same as always,’ she replied with a shrug. He nodded. The things they had experienced together in the past shaped their current relationship in exactly the ways you would expect. He placed the object back where it had been before he picked it up. ‘Some things never change,’ he said. ‘Everything changes,’ she said, just as she had on that one occasion before. He felt the same way about it now as he had back then. Would the same thing happen this time? He already knew the answer. When he had set out on this long sojourn, he’d known it would be risqué, but no one had appraised him of just how risqué, or even eluded to it. Even if they had, he would of been suspect of them having an anterior motif. But that was a mute point now. These viscous criminals would test his medal irregardless of weather he wanted them too – he just had to keep his moral up in the mean times.